Although many of Russia’s Olympic stars have the classic Slavic looks the world has come to associate with Russian athletes, the 2012 Russian Olympic team will feature competitors who do not fit this stereotype. Russia Beyond the Headlines’ Timur Ganeyev spoke to several Russian athletes of mixed race about their athletic accomplishments and the challenges of being a person of color in Russia. Russia’s track and field performance at the 2012 IAAF World Indoor Championships in Istanbul was a bitter disappointment to fans. The Russian team came in fifth overall with a single gold, two silver and six bronze medals. With fewer than four months until the Olympics in London, the situation appears quite alarming. But despite the national team’s poor overall results, some Russian athletes pulled off a pleasant surprise. Lyukman Adams, a Russian triple jumper of Nigerian origin, who was making his debut at World Championships, won the bronze and was only 13 inches short of the gold. With a very impressive 56.9 feet jump, he is packing his bags for London as one of the triple jump favorites. Lyukman Adamsis the first dark-skinned athlete on the Russian national track-and-field team. Born in St. Petersburg to a Nigerian father and a Russian mother, Adams considers himself 100 percent Russian. Russia Beyond the Headlines: How is your life in Russia? Have you ever thought about moving abroad? Lyukman Adams: Russia is my motherland. I grew up here and I was raised in the Russian tradition. I believe myself to be a full-blooded Russian. A few years ago, I embraced Orthodoxy. You can meet any sort of people in our multiethnic country. I am half-Nigerian but I have never been to Nigeria and have no idea about Nigerian culture. So I have never thought about emigrating. I am part of Russia’s national team; I live in the capital city; what else do you need to feel happy? RBTH: There is heated debate about racism in Russian sports. Have you ever suffered from racial abuse? L.A.: Racism does exist in Russia but is there anywhere without racism? The thing is that, in our country, journalists tend to focus on it. I have never encountered any racism. There are many skinheads in St Petersburg. I grew up in a ghetto and knew all the local skinheads. They would greet me and respect me. I have never seen skinheads in Moscow, maybe because I don’t go out much. Only mad people throw bananas from the stands – they know nothing about true racism. To toss a banana is a sort of entertainment for them. RBTH: Tell us about your performance at the 2012 World Indoor Championships. L.A.: Last year I surpassed the 17-meter [55.7 feet] mark for the first time. Then I took a pause in the summer because of an injury. In November, I resumed training and felt even better than in the winter of 2011. I easily qualified for the World Indoor Championships and was jumping well over 17 meters. So I succeeded in staying in good form until Istanbul, where I jumped my personal best and won a medal. All my dreams are about the Olympics now; I want Russian fans and my family to be pleased with me. Victor Keyru has already experienced the thrill of the Olympics. The basketball player, born in Rostov-on-Don, played for the national team in Beijing in 2008. His father is a former track and field athlete who came to Moscow in 1980 as part of the Nigerian Olympic team. When Keyru was still very young, his family decided to send him to one of the best basketball schools in the Soviet Union, UNIKS, based in Kazan. He played a couple of seasons for the reserve team and then moved up to the first team. He was loaned to other clubs many times and made an unsuccessful attempt to be drafted by to the NBA. Keyru is currently a leading player for Spartak St Petersburg. Keyru hopes to show his best game in London, to help the national team make it past the group stage, something that Russia failed to do in Beijing in 2008. RBTH: How is your life in Russia? Have you ever thought about emigrating? Victor Keyru: I have lived in Russia all my life. My father originally came from Sierra Leone, from a rather rich and noble family, by local standards. When he graduated, things went badly for his family in Sierra Leone, the situation in the country changed, and he decided to stay in Russia. He married a girl from Rostov and defended his Ph.D. thesis on concrete mixtures. During perestroika, he went to Europe to make money, then he tried doing business in Russia. When things were good, he provided for his family, but recently we have been supporting him – he has gone back to Sierra Leone and we only talk on the phone. I have never been to Africa and I have never thought about emigrating. I naturally want to play in the NBA but I have had no chance so far. St. Petersburg suits me and my family – it is a nice European city with centuries-old traditions. I like it even more than Moscow. I am focused on my games for Spartak and the national team. RBTH: Have you ever encountered any racism? V.K. : There are lots of black basketball players. I have never heard any racist chants during games, but I have come across unpleasant people off the court. They were trying to show something, to tease me, but I ignored them. RBTH: Any hopes of going to the London Olympics? V.K. : I talked to [Russian national team coach] David Blatt, and he said that he believed in me. For my part, I can only promise that, if I do make it on to the Olympic team for the second time, I will do my best for Russia to get past the group stage. I am in a good shape now and can compete for a spot in the starting lineup. Victor’s sister Katerina Keyru is keeping pace with her brother. She went to her brother’s training sessions and they suggested she should come out and play. 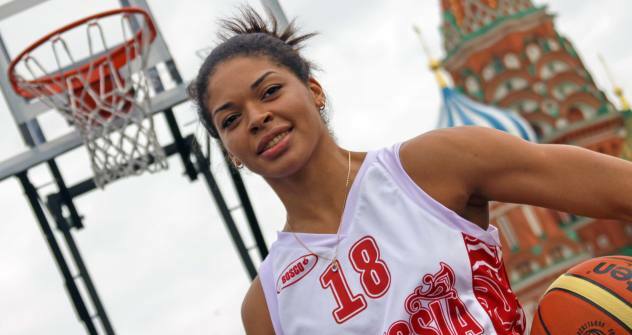 Since then she has copied her brother’s achievements, reaching the Russian Basketball SuperLeague. She has also graduated from music school and has been invited on to the national team three times. RBTH: How’s it going for you in Russia? Have you ever faced any racism? K.K. : I feel comfortable here. It is my country; I was born here and I have visited almost all the big cities. I have never come across racism but, when they throw a banana at a football player, I get ashamed of my country. We may be denied a chance to hold large tournaments because of some people’s behavior. We need to struggle against racism at football stadia – impose fines and talk to fans. RBTH: Do you think you have a chance of going to the Olympic Games? K.K. : For a basketball player, the Olympics are the most important tournament, held once every four years. I would very much like to go to London and help my team win a medal. This is my sports dream. When Victor played for the national team in Beijing, we were all happy for him. Emilia Turey, leader of the Russian national handball team, also has exotic origins. She has never seen her father, because the student from Sierra Leone fled to his native country as soon as he learned that his wife was pregnant. Emilia started playing for “Astrakhanochka” and then launched a breathtaking career in the Danish clubs “Slagelse” and “København”. She has also played for Spanish “Itxako”. She has won numerous club trophies but succeeded most with the Russian national team, winning the 2005, 2007 and 2009 World Championships, the silver at the 2008 Olympics in Beijing and the bronze at the 2006 and 2008 European Championships. She was named the best left winter at the 2011 World Championship. She is missing only one medal – the Olympic gold. RBTH: How’s your life in Russia? Have you ever faced any racism? E.T. : People at airports are still surprised that I have a Russian passport. People don’t believe I am Russian, although I have lived in Russia all my life. There is no such thing in Denmark or Spain, although I cannot say that someone ever hurt me here. They love me in Rostov and always support me during all our home games. RBTH: Will you bring the Olympic gold to Russia? E.T. : We will do our best. The final match in Beijing was etched in my memory forever. We played poorly in the first half, offering the Norwegians a comfortable head start, and when we finally stepped up our game, it was already too late. We would like to get back at them. We have grown stronger over the last four years; we believe in our strength and hope to win.